I'm beginning a Lego series of etches with this tiny set called "Treasure Cart". When I was 10, Lego Castle built a stronghold in my heart, so it's fun to go back and explore this collection for a series of etch-a-sketches. pure skill! looks just like the box art! never shake that etch-a-sketch! Legos plus Etch-a-Sketch. It doesn't get much better than that! yes, i agree! two wonderful, nostalgic things brought together.. so much fun thanks! Wonderful job with this sketch sir. thanks so much appreciate it! thanks for the kind words, appreciate it! 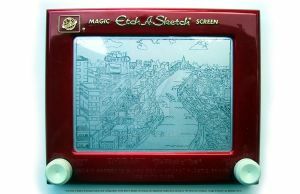 Holy crap, I didn't know such could be achieved on an Etch-A-Sketch! thanks! it's a very under-used medium, but you can do really a lot with the little toy once you learn to control the knobs.. Puts my Etching skills to shame. thanks so much! more lego etches to come, i'm looking forward to doing the large castle..
And after you took this picture, did you erase the etch a sketch drawing in side? 1463 is the Lego set number. I plan to do others from the Castle collection, and they will each have different set numbers in the top right corner. And yes, I did shake this afterward. It was a very difficult erase for me, as I think this is a fun piece. Thanks!